I’m trying to setting dev env for Metasfresh in Windows 10. I use eclipse as the IDE. I’ve followed the dev guide to import the repos, config maven and build the projects from maven cli. Following the steps to getting started in eclipse, I’ve imported the projects in the eclipse. But, I’m not able to find the .launch files specified in the guide. Can someone please help me understand how to run and debug the application from eclipse? my apologies, these docs were a bit outdated. The locations of your screenshot’s .launch config files have changed a bit. I just updated documentation, I hope it now serves better. 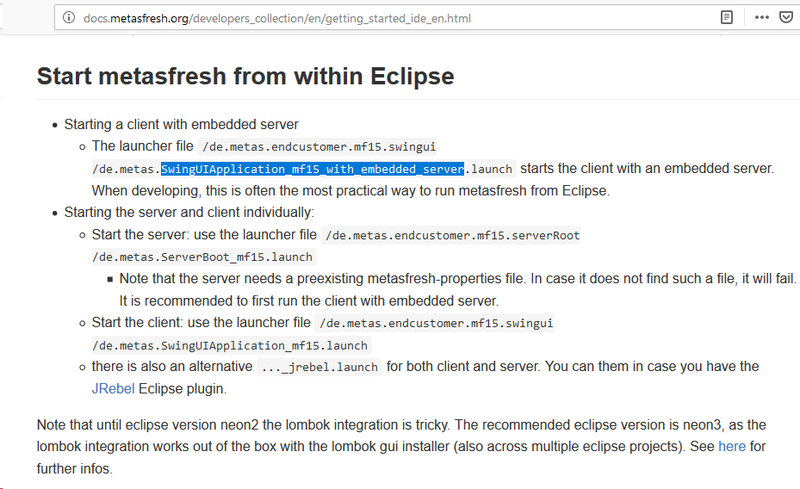 Anyways, when in doubt, you can identify all launch configs within eclipse using Ctrl-Shift-R and then filtering for *.launch. Thanks @metas-ts for updating the document. Would recommend any tips for debugging the app in eclipse? Thanks for your inputs. I was able to setup the dev env, with the dev-DB, as guided in the developers index. But the, I’ve landed into issues. Please help me to sort these out. This is going to be a long post! Please bear with me. I’m trying to work on the issue 5010. Hence, I thought to switch to a remote DB (95.216.200.191:5432), where the test application (asc.mykloudz.ae) is already running. I just deleted the ‘metasfresh.properties’ file, so the I can provide new connection details. Since I got errors, I thought of returning back to local dev-DB. I tried again after deleting the ‘metasfresh.properties’ file. But now, I’m getting errors in connecting to dev-DB as well! Now, neither I’m able to connect to remote DB nor able to work with local DB. Please help me resolve these issues. Along with all the above issue, I also get error with MQ connection. There was no mention about setting up a MQ in the developers index. What is MQ used for? Is there any documentation about it? Or, is there way I can disable the use of MQ? Thank you very much for your patience. Hope to see a response from you soon. I’m sure you are very busy. But, please spare some time to help me. I’m stuck with the below errors. I get this error when I run ServerRoot ot SwingUI. When I run Webui-API, I get following erro. Seems to hint at a database that’s not as resent as your code. Did you already have a look at http://docs.metasfresh.org/developers_collection/en/getting_started_db_en.html, particularly the part about " Update the database from the master branch" ? Yes, the issue was with the DB, it was not in the latest version. There was a problem with applying the scripts. I modified two queries in the scripts and was able to upgrade the DB to latest version. Also, I’ve installed RabbitMQ and set it up based on some config files. Now I’m able to run the application. I’ve some more questions for you. Is there a docker for the dev env? Like a container with eclipse, maven and other stuff pre configured. When I run the app using the launch files, if I make changes to code, will it be hot swapped immediately? or, should I build and re-launch the app? To Run the metasfresh-webapp-frontend, we need metasfresh-webapp-api. The ServerRoot is not mandatory. Then, for what purpose is this ServerRoot used? Is there a way, I can disable MQ and elastic in the dev env, just to reduce the resources consumed and increase the start-up time? Is there a way, to disable/remove some modules which I won’t be needing during development? Like the pharmacy vertical is probably not required for me. Some of these questions might be silly, but please spare some time to reply.